Rioters attacking a building on Lexington Avenue during the New York Draft Riot of 1863. Drawing appeared in William J. Bradley's "The Civil War: Fort Sumter to Appomatox". In 1863, the United States government implemented the Conscription Act, which was also known as the Enrollment Act. The Conscription Act required states to draft men to serve in the American Civil War if individual states did not meet their enlistment quotas through volunteers. The federal government oversaw the draft and created provost marshals to enforce it. All white men between the ages of twenty and forty-five years of age were eligible for the draft. The Conscription Act permitted drafted men to pay a commutation fee of three hundred dollars or to hire a substitute to escape service if they were drafted. A total of 310,654 Ohioans served in the Union army for varying lengths of time. The federal government required each state to supply a set number of soldiers determined by the state's population. Ohio exceeded the government's call for men by 4,332 soldiers. This number does not reflect the 6,479 men who paid a monetary fine to the government to escape military duty. Despite the large number of Ohioans who served in the Union army, not all Ohioans supported the draft. Many of these opponents were members of the anti-war or "Peace" section of the Democratic Party and encouraged men to resist the draft or to desert once they were drafted. In Hoskinville, residents attempted to hide a deserter from government authorities. The local federal marshal called in soldiers to arrest the deserter. In Holmes County, nine hundred men armed themselves and refused to obey the draft law. Approximately 450 Federal soldiers came to enforce the Conscription Act. A brief skirmish occurred, with the soldiers emerging victorious. This incident became known as the Battle of Fort Fizzle. There were a number of other protests in the state, but government authorities easily put down most of these uprisings without having to resort to violence. Other states experienced similar protests. 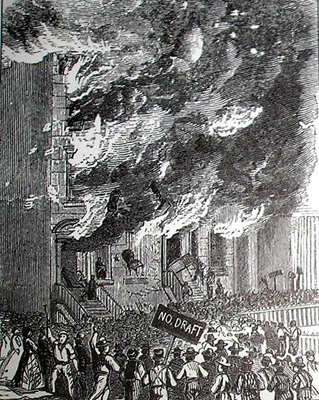 Draft riots occurred in both New York City, New York and Boston, Massachusetts, not to mention innumerable other communities.